The top of this Strawberry Chocolate Chip Cheesecake consists of a thin layer of strawberry glaze that is sprinkled with bits of walnuts and covered with fresh strawberries. This cheesecake underneath is made with farm fresh dairy products and cream cheese with mixed in chocolate chips. The result: a smooth and delicious fruity cheesecake with chocolate and a nutty crunch. The cheesecake is 9-inch in diameter and will serves 8-10 people. 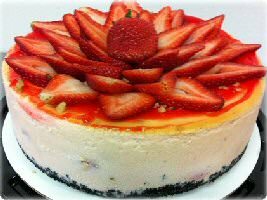 The Strawberry Chocolate Chip Cheesecake is handmade, freshly baked specifically for your order and will ship 2 business days after your order is placed. It will be shipped directly from the baker in its own thickly insulated shipping box, packed with dry ice, and will incur a separate shipping charge. Ingredients:cream cheese (pasteurized non-fat milk and milkfat, cheese culture, salt, stabilizers [xanthan and/or carob bean and/or guar gums]), sugar, eggs, semi-sweet chocolate chips: (sugar, chocolate cocoa butter, milkfat, soy lecithin, natural flavors), vanilla, sour cream (cultured pasteurized grade A milk and cream, enzymes), fresh lemon juice, vanilla (vanilla bean extractives in water and alcohol [41%]). Strawberries, glaze (water, high fructose corn syrup, modified cornstarch, sugar, salt, natural flavors, potassium sorbate and sodium benzoate added as preservatives, lemon juice concentrate, citric acid, red #40). Chocolate cookie crust: (sugar, enriched flour (wheat flour, niacin, reduced iron, thiamine mononitrate [vitamin B1], riboflavin [vitamin B2], folic acid) high oleic canola oil and/or palm oil and/or canola oil and/or soybean oil, cocoa (processed with alkali), high fructose corn syrup, cornstarch, leavening (baking soda), salt, soy lecithin (emulsifier), vanillin - an artificial flavor, chocolate. Allergy warning: contains wheat and soy. May contain traces of milk, eggs, pecans and peanuts), butter (cream, natural flavoring, contains: milk).